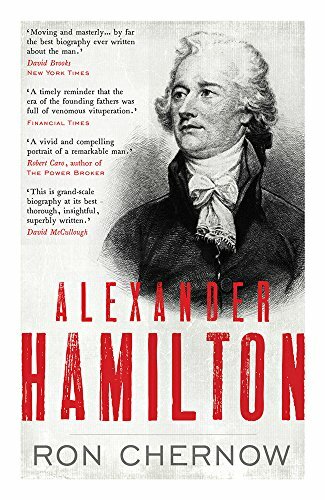 Seldom have I enjoyed a biography as much as I did with Ron Chernow's brilliant book about the first Treasury Secretary of the United States - Alexander Hamilton. Most will know of him from the $10 bill (a recent plan to replace his image with one of Harriet Tubman has been reversed - she will replace the slave owner Andrew Jackson on the $20 bill instead). There are two reasons in the main why I enjoyed this book: first, it is very well written and easy to read, secondly, Hamilton was a fascinating character who crammed in so much into his short 49-year life. Much is made of his rise from being an orphan born out of wedlock on the island of Nevis in the West Indies to being one of the founding fathers of the United States. He certainly was a self-made man who used his own initiative and brilliant brain to climb the political ladder. Inevitably he made enemies along the way like Thomas Jefferson, John Adams, and Aaron Burr. He was a brave soldier during the Revolutionary War seeking to command as well as provide George Washington with advice that he both needed and valued. His setting up of banks and his steady hand at the helm of the Treasury Department ensured that the early days of the United States were successful. An abolitionist, slavery was always at the back of policy - he predicted 60 years before it eventually happened would end up causing a Civil War. His needless death at the hands of Aaron Burr in a duel cut short the life of one of the greatest Americans. The award-winning musical "Hamilton" (based on Chernow's book) has also renewed interest in Alexander Hamilton. Is has been one of the most successful musicals ever on Broadway, and also one of the hottest tickets in New York. Some are available for next year - one seat will cost you $849 on Ticketmaster. What stands out for me about Alexander Hamilton is his honesty and integrity - he never sought to benefit financially from his Government work, frequently going pro bono. His enemies accused him many times of corruption, but he died in debt and never had the riches he could have taken. Compare this to our politicians today and the candidates for the Presidency of the United States - a man like Hamilton would be a shining stand-out beacon of honesty and hope who would have always put his country first.